Recommended for professional audio as a woofer in sealed and vented enclosures. Also useful for bass guitar. Specifications: *Power handling: 300 watts RMS *VCdia: 2" *Le: 1.10 mH *Impedance: 8 ohms *Re: 6.32 ohms *Frequency range: 45-3,700 Hz *Magnet weight: 34 oz. 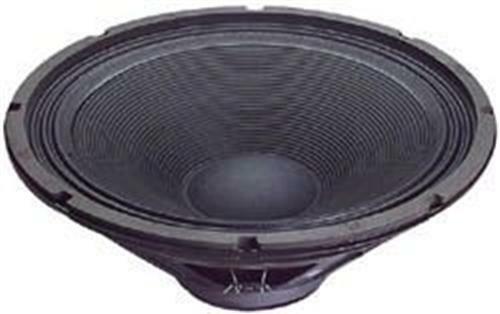 *Fs: 35 Hz *SPL: 98.2 dB 1W/1m *Vas: 11.8 cu. ft. *Qms: 8.10 *Qes: 0.63 *Qts: 0.58 *Xmax: 4.0 mm *Dimensions: Overall Diameter: 15.15", Cutout Diameter: 13.77", Mounting Depth: 6.05".